I'm back with a simple swatch of Pretty & Polished Pretty Chameleon. I almost bought it during their spring sale, but I decided to be good and only buy a few colors. I was talking with a friend shortly after and she said that she had Pretty Chameleon, and would love to pass it along. 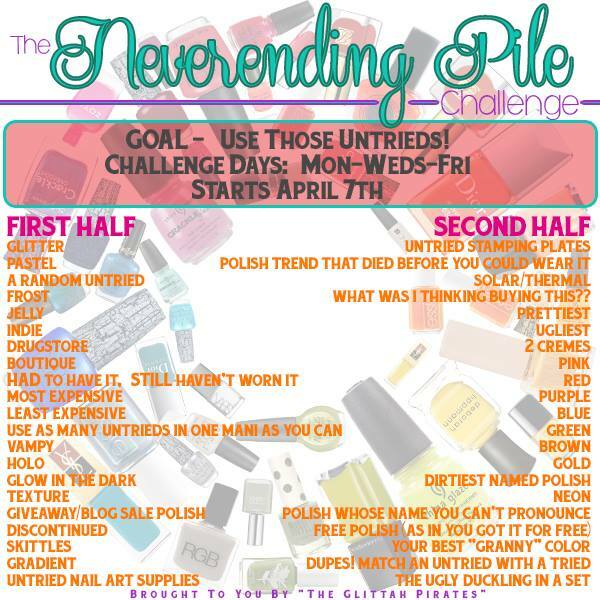 I figured this would be the perfect color to used to jump into the Never Ending Pile Challenge (NPC). I was extremely late getting started, but I figured it was better late than never. The challenge was started by the lovely ladies of The Glittah Pirates Facebook group. Here's the photo for each challenge. Pretty Chameleon is a dark to light pink thermal with pink and purple micro glitter. It appears dark pink when cold and light pink when it warms up. Shown above is two coats with no base color. The formula was a nice consistency and applied evenly with little effort. I did have a little trouble getting this to transition from dark pink to light pink, but it had nothing to do with the polish. I am almost always cold from mid September through most of May, so capturing that warm phase was rather tricky. Of all the Pretty and Polished thermals I own, I think this one is my favorite because of the subtle glitter flecks. This lovely color was a gift from Shelby at Shelby Lou Nails. Please check out her blog and leave a comment or two! Do you have any thermals? If not, which ones have caught your eye? I own one whole thermal; this one! I really need to give it a try. Do it! I think it would look cute with stamping or studs or both! I want to own a thermal polish now. There so cool! The color change is awesome on your long nails!